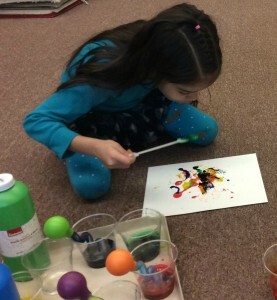 Students in K4 and K5 enjoy art instruction in their contained classrooms. Their teachers teach art lessons, integrate art into their core subjects, and develop art centers for their students. The students learn the basics of coloring and cutting to allow them to later integrate these skills into more advanced studies of art. Through art instruction, students develop creativity, self-expression, and communication. They also develop the character traits of perseverance, understanding, and creative problem solving. Art class allows children to express their creativity, use their imaginations, and develop artistic talent in a relaxed environment. 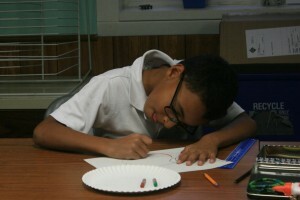 Elementary students enjoy 30 minutes a week of art instruction. They explore the basic elements of art such as color, line, shape, value, texture, form, and space while creating fun projects. Other projects are inspired by the works of famous artists to teach students about historical movements and differing applications of the basic elements. Classroom teachers also integrate art into their daily lessons allowing students to form connections between art and their other classes. Students may create biomes in science, create a time line in history, or draw illustrations in their English and reading classes. Teachers encourage the students to draw from the knowledge they learned during their art class for these projects.